Seniors Maggie Frieler and Kayla Nelson were recently given Lions Service Awards for November to recognize their community service and volunteer efforts. Seniors Maggie Frieler and Kayla Nelson were recently given Lions Service Awards for their community service and volunteer efforts. Each year, the Paynesville Lions Club recognizes eight seniors at Paynesville Area High School for their volunteer work, both at school and in the community. Frieler and Nelson were selected for the month of November. Both Frieler and Nelson said they were honored to be selected, with Frieler adding that she was a little surprised and Nelson adding that she was pleased that others saw positive qualities in her and appreciated what she has done. Volunteering is important, said Frieler, because "I think it's important to serve others. It is how we become better people. We should do good because it is right, not because we can somehow be repaid." "I have always enjoyed keeping my life very busy," said Nelson about the value of volunteering. "And I have been very blessed with a great life, great family and friends, and I enjoy helping other people and hopefully helping them out." Frieler, the daughter of Jane and Steve Frieler, serves on the Paynesville Human Rights Commission and has been a peer helper, peer tutor, and student aide in kindergarten. She also has participated in danceline, gymnastics, and track and helped with the yearbook last year. At St. Louis Catholic Church, she has taught Sunday School, served at Mass, helped at funerals, and taken two mission trips to Indian reservations in South Dakota. "My favorite memory from service work is working with the kids at the Pine Ridge Indian Reservation," she said. "They were just so innocent." Frieler, who is attending St. Cloud Technical College this year through post-secondary option, plans to continue her college education next year though she is undecided about where she will attend. Nelson, the daughter of Dave and Diane Nelson, is a peer tutor, peer helper, library aide, president of SADD, member of the National Honor Society, and editor of the school paper. She plays in the band, choir, and pops choir and participates in gymnastics and volleyball. She was Homecoming queen at PAHS this fall and also is the reigning First Princess for Paynesville. At Paynesville Lutheran Church, she teaches Sunday School, sings with the youth worship team, and provides special music. She also is the president of the Southwest Synod Lutheran Youth Organization, and she has helped with day camps, with Vacation Bible School, and has taken mission trips to inner city shelters and to the Ronald McDonald House and nursing homes. Her favorite service work was at the inner city shelter, the Marie Sanvick Center because she got to "teach them about faith and friendships. I personally got to know a little girl named Jenny," she said. "She was shy, and her mom was deaf, and so instead of telling me her name, she signed it. And to her surprise I myself know sign language, so we spent a long time talking and signing. The kids there have such big and loving hearts for all they have been through!" Nelson plans to attend college next year, to study either pediatric physical therapy or ministry, but she is undecided about a school. 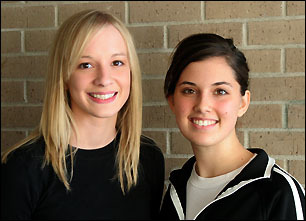 Seniors Kelly Herzberg and Laura Weidner previously were selected for the Lions Service Award in October.